This image is a companion to this one we saw two weeks ago. The man is identified as H.S. Galligan. He appears to be inspecting bare root nursery stock ready for planting a new orchard. I always enjoy seeing how a commercial photographer under contract manages to show off his artistic skills even when his charge is to bring men to the valley to buy orchard land and grow apples to keep the packing houses busy. I hope his clients appreciated his talent. This is Hubert Sam Galligan. His father was James Galligan who came here from New York. Galligan's did have orchards, but don't know whether H. S. Galligan was an orchardist. I know one of my cousins married into the Galligan family. Hubert had two wives, Lola and Margaret. Hubert S Galligan was my grandfather who was born in Paw Paw, Michigan. He had a ranch on Dethman Ridge where he also had a nursery, the True to Name nursery. He and my grandmother, Margaret Frazier, had five daughters: Eleanor, Alice, Mildred, Georgia and Marjorie. He later married Lola Graff. He died in January 1945. Congratulation Norma on a photo of family member. 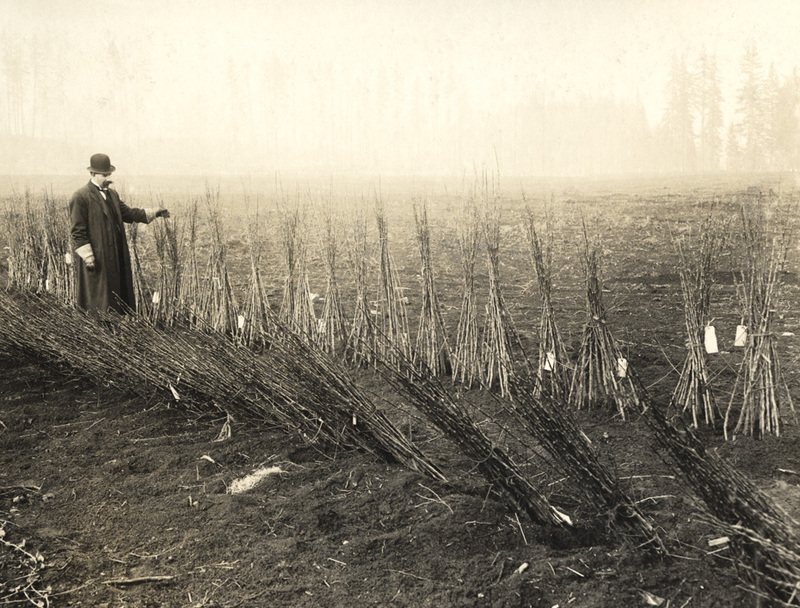 In the early 1900's how many years would it be, before these root stocks would produce a crop? I assume the apple trees were an older variety that grew taller than what we see now in the orchards. Indeed, Arthur, that's a beautifully composed photo. Interesting information Norma. Didn't know your family went that far back in the Valley. You and Mary definitely have "roots" in the Valley. Good to hear you are back in that area. Don't know what year my grandfather arrived but my grandmother came in 1883 when she was 9 years old. One interesting fact is her sister Lavina married Hubert's brother Carl. Also have a Jubitz brother and sister who married a Rankin sister and brother. Was probably very common at that time.